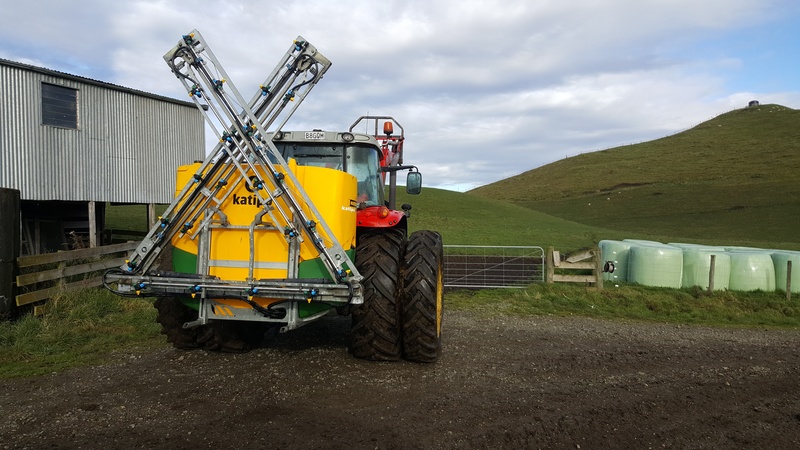 The Chrystall's farm 2200 hectares in total, and their sprayer has racked up around 800 hectares of spraying in the 12 months since they purchased it through Mech Agriculture, most of it spraying on steep country with the farm reaching 850 metres in altitude. The Hustler boom sprayer is being utilised on all 6 blocks with up to 40 minutes travel between them so having the sprayer set up for quick and easy switching between tractors was a bonus. Having their own boom sprayer on the farm has been a game changer for the yield of their winter crops, and the sprayer was the first piece of equipment they invested in when they started with the winter feed crops. Mark points out that "when you've got a spraying window, everyone wants the local contractor and you're at the mercy of their work load, but the crops have got to be sprayed, that's why we got our own sprayer". with it has been fantastic"
"If the agronomist comes out and we've got a problem with a crop, we've got to get the spray on, with our own sprayer we can be in the paddock spraying for it the very next day, there's no delay in getting the chemical on" says Mark. "Timing is absolutely critical, it directly determines how much yield we're getting. We're yielding 30 ton/Ha as an average and that's directly related to timely and accurate application." Rich points out that previously they'd use helicopters for the steeper country spraying, but the conditions needed to be very calm because of the amount of drift, since they've had the sprayer they're doing more of this steep country spraying and with the air induction nozzles and boom close to the ground he can spray in virtually any condition. This was especially important last November when 6 weeks of wind kept most farms in the area from getting their crops established, but being able to spray themselves was a life saver. Mark and Richard went for the full GPS guidance, swath, and application rate control unit for their sprayer and believe that not only is it easier to use than a conventional spray system, it's saving them a lot of chemical each year. They're putting through between $20,000-$25,000 of chemical through the sprayer each year, and the GPS system has saved between 10-15% of those costs. hectare every couple of minutes"